Preheat oven to 350º F. Prepare three 9-inch round cake pans with nonstick baking spray. Slowly combine wet ingredients. Pour oil into a large bowl. Slowly add eggs one at a time, making sure to fully incorporate each egg before adding another. Pour milks and vanilla into measuring cup and whisk together with a fork. Sift together flour, sugar, baking powder, and salt. Alternate adding the dry ingredients into the wet mixture, beginning and ending with dry ingredients. Gently stir all ingredients until well combined. Stop mixer and scrape down sides and bottom of bowl, making sure to have all ingredients mixed well. Evenly distribute cake batter between cake pans and place pans into oven. Bake for 25-30 minutes, or until a toothpick or cake tester inserted in the center comes out clean. Remove and allow to cool slightly in cake pans for about 5 minutes, then cool completely on a wire rack. While the cake bakes, prepare the candied bacon for the oven. Line a pan with foil, and lay the bacon out on the pan. Sprinkle brown sugar evenly the bacon. 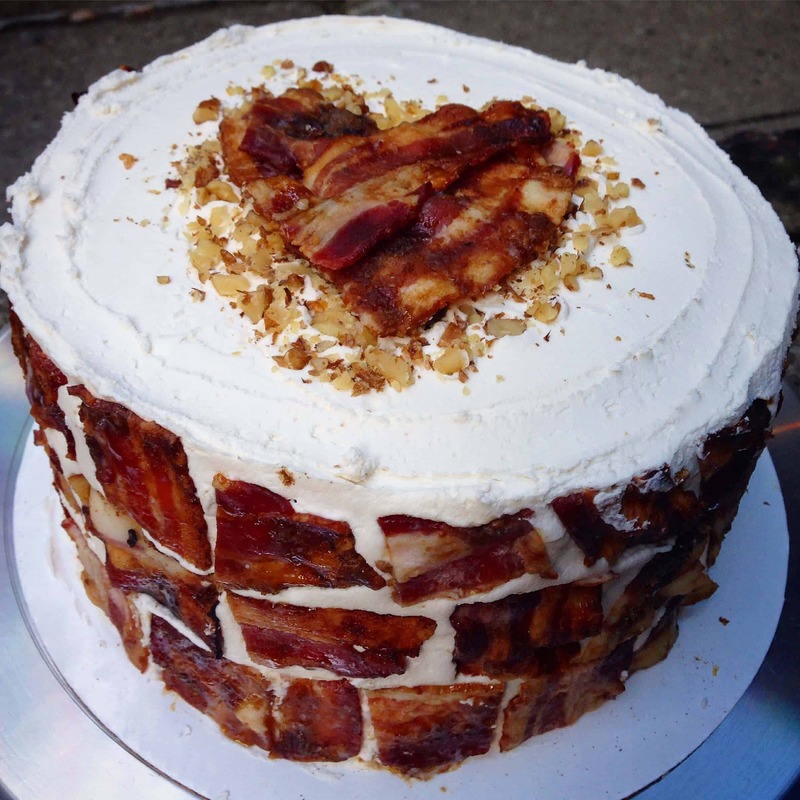 Once the cake is done baking, increase the oven temperature to 400 degrees Fahrenheit, and bake the bacon for about 15 minutes, until it just begins to brown. Remove from the oven to cool. Place bacon on layers of paper towels to absorb excess grease. Pour the bacon fat from the pan into a separate (heat-proof) container to cool. This will be used later in the frosting. While the bacon cooks, prepare the cinnamon walnut filling. Combine the softened butter, cinnamon, salt, powdered sugar, and walnuts in a medium sized bowl. The last prep step is to make the frosting. Using a hand mixer or KitchenAid, combine the butter and cooled bacon grease. Slowly incorporate the the powdered sugar, over several installments. Add in the maple extract, and add heavy cream as needed. Mix on high for a couple minutes, until the frosting is light and fluffy, and all ingredients are fully incorporated. To assemble the cake, frost the base layer of the cake, then top with half of the cinnamon walnut mixture. Swirl it around into the frosting, and repeat with the next cake layer. Top with remaining cake layer, and apply a thin crumb coat of frosting. Refrigerate for 30 minutes to allow the frosting to set. 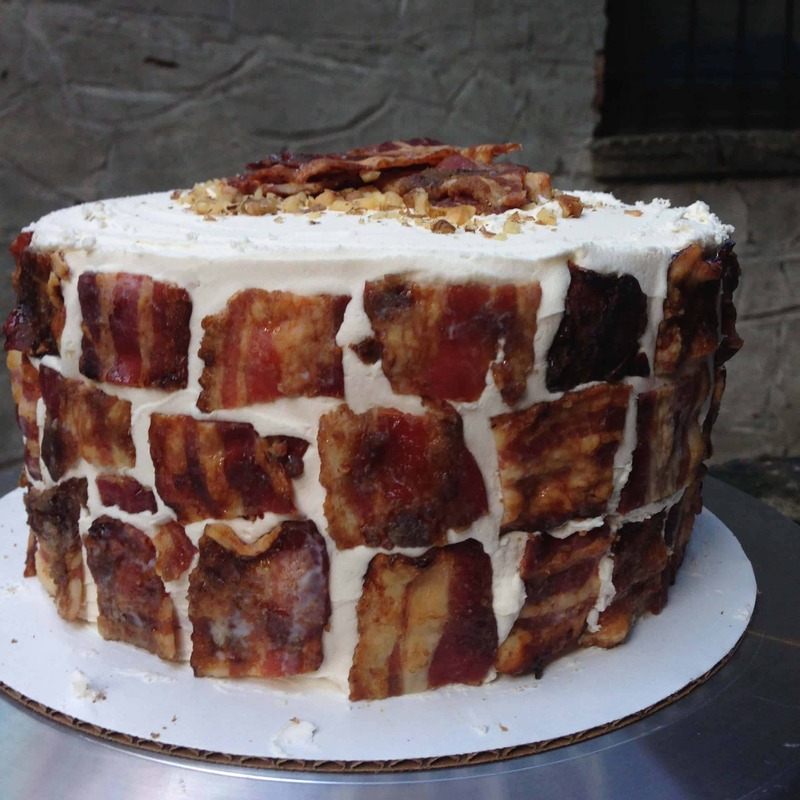 Apply a thicker layer of frosting, and then garnish the sides of the cake with the cooled bacon pieces. I also made swirls of frosting on the top of the cake using a closed star frosting tip. I love the idea of using bacon fat to make the icing… yum!